July 22-28, 2018 one week. Hello from Minnesota! Are we excited to enter our 18th state? You betcha! They really do say that up here! We originally had booked a week at the La Salle Lake Campground at Itasca State Park. A few days before we were due to check in, Chris looked up the cell coverage and discovered there was not going to be any so we had to cancel our stay there (cost us 2 nights pay) and found a new place in Bemidji called Royal Oaks RV park. On Sunday, since our drive from Jamestown to Bemidji was going to be 5 hours and the Itasca State Park was on the way to Bemidji, we thought about stopping at the Headwaters for our lunch break and exploring. I called while we were driving and got the details from the park ranger about which entrance to go to and where to park the RV. We had already passed the North entrance by that time I got ahold of the park ranger so we had to turn around. We pulled over and unhitched the Jeep and Chris managed a U-turn. 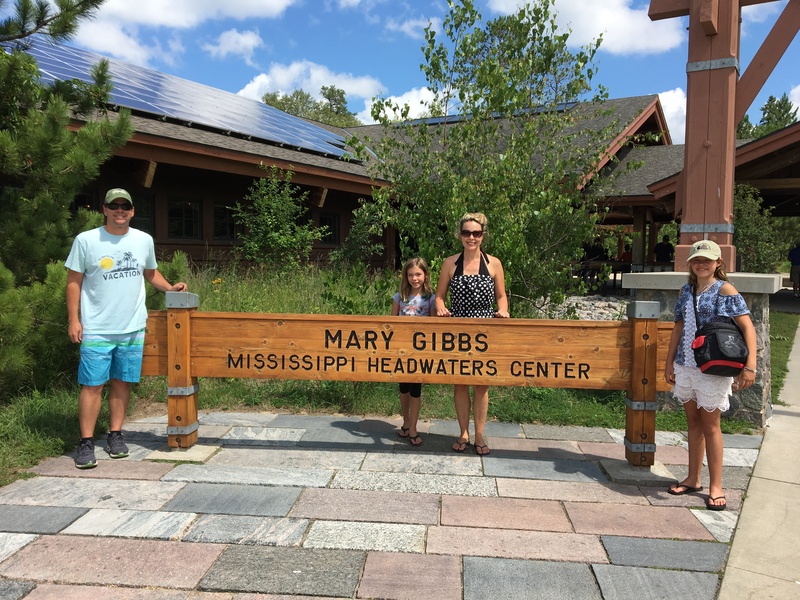 Mary Gibbs Headwaters Center is what you need to search for on GPS when trying to find this place. We parked, ate lunch and changed into our swimsuits. Itasca State Park (oldest state park in Minnesota) is the birthplace of the Mighty Mississippi River. It starts flowing out of Lake Itasca over a row of rocks that you can simply walk 18 feet across. Minnesota has more miles of this Mississippi than any other state. When we were in Louisiana, we put our hands in the Mississippi River where it ends into the Gulf of Mexico so it’s only natural that we needed to find the headwaters where it begins. Itasca is that place. This picture shows a sign for the Mississippi River and a small bridge that crosses over it, can you believe how small it is? It’s a short hike from the parking lot to Lake Itasca and the headwaters. You can walk across the rocks, wade across the small pebbles or walk across the log they have laid across it. The girls also decided to get in their tube floats and try to float down the Mississippi River. They started in the lake, scooted over the rocks, then crawled (with their butts lifted off the ground) until it was deep enough to float down the Mississippi River. I walked along side of them where it was only 3 feet wide. They came up with a whole plan to float down the 2552 miles to Louisiana. When we decided to turn around and head back upstream, the current was a lot stronger that we imagined. I pulled the girls back to our starting point for a little extra exercise. There was a webcam set up at the headwaters so it was fun to call a few people and have them log on to wave at them. People jokingly say that the Minnesota sate bird is the mosquito… I can see why! Next we headed up to Bemidji. The Mississippi actually flows north through this town before it starts heading south towards Louisiana. Monday, we drove into town which was only 5 minutes away to check out the Paul Bunyan and Babe statue. We had seen a larger Paul Bunyan and Babe statue in northern California but Bemidji makes the claim of their birthplace. There is a nice visitors center with Paul Bunyan artifacts. It’s so silly they have all this for a fictional character. The fireplace pictured is neat because it has a stone from all 50 states. There is a nice playground next to the statues. We walked around the city and came across a used mixed media store. We browsed the store and found 3 movies to buy. Mackenzie found a painted rock. She carried it to the Paul Bunyan statue and hid it. Back at home, Chris was pretending to be Paul Bunyan with the tiny bananas I had bought at the grocery store. Tuesday and Wednesday we just did school work in the screened in community porch. There was great wifi and plenty of room to spread out. We did some fun art projects. We were able to play bocce ball and practice golf this week. Thursday I took the girls geocaching for the first time. The city of Bemidji has a ton of geocaching finds. This lead us on a tour around the city and an adventure on the Paul Bunyan Trail. The Paul Bunyan State Trail, stretching 119 miles from Bemidji to Brainerd, is one of the longest rail-trails in the country. The multiuse, fully paved trail is mainly for nonmotorized use; however, snowmobiles are permitted during winter. Speaking of snow activities, we saw some kids practicing skiing on roller skies. The girls enjoyed the last find which I agree was the best. They left a few treasures for the next people. Friday we went to the Headwaters Science Center. It was a small older science center. And it was super crowded with a large group from the Boys and Girls club. We had been studying the skeletal system and they had x-rays for us to look as well as Mississippi River information. Mackenzie is really into snakes so she loved that they pulled them out of the tanks for her. Mackenzie drew this in the sand one day, which reminded me of the movie Dragonfly with Kevin Costner, remember that one? I found the movie but the girls did not like the movie…too intense.